Ore crushing plays an important role in dressing plant and is a necessary crushing process that cannot be ignored. With the development of national infrastructure projects, the demand for ore production is increasing, and the dressing plant pays more and more attention to the design of ore crushing. The investment of crushing and grinding in the dressing plant accounts for about 60% of the total investment, the electricity consumption accounts for 50-60% of the whole project, and the production and operation expenses account for more than 40%. The design and operation of the crushing section have a direct impact on the economic index of the dressing plant. 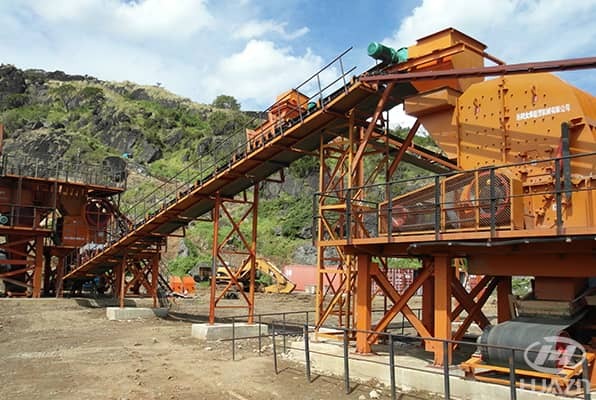 Ore crushing is to reduce the particle size of raw ore to 1/1000 or even 1/10000 of the original, therefore, it is impossible to complete all the crushing process by one crushing equipment, which needs to be completed in series by several stages, the crushing stage can be divided into coarse crushing, medium crushing and fine crushing. Large ore raw materials are fed to the jaw crusher for primary crushing by the vibrating feeder, the crushed materials are transported to the impact crusher or cone crusher through belt conveyor for fine and medium crushing. The larger grain size material return back to impact crusher or cone crusher for further crushing, and the qualified materials are sent to sand making machine for shaping after sieving. If the finished products need to be cleaned, send to sand washer.